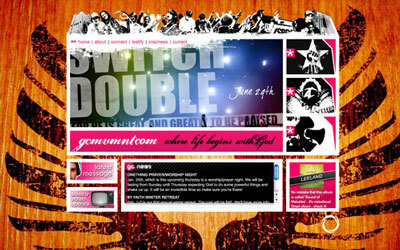 Any web designer subscribing to Screenalicious, CSS Mania, or Best Web Gallery can attest to the recent rise of hip, high-quality church web sites. 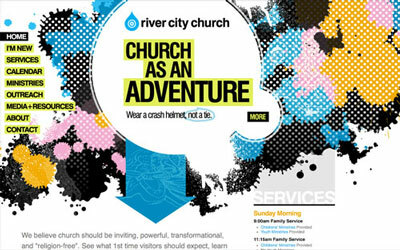 A non-churchgoing designer might wonder how places of worship fit in amongst software startups and cutting-edge businesses; yet, these churches are branded as intensely as any business and supported by savvy church-marketing communities on the Web. I interviewed some of the industry’s top church designers and marketers to understand how design helps communicate the spiritual life. In the 1960s and 1970s, many Christian churches made overt efforts to attract younger and more diverse congregations. The advent of Christian rock music and large outdoor festivals helped make the churchgoing experience more approachable to younger crowds. Throughout the 1980s and 1990s, youth church events became larger, more noticeable, and more countercultural, at least aesthetically. Their flyers and marketing materials began mirroring the gritty and irreverent imagery usually reserved for secular rock bands. 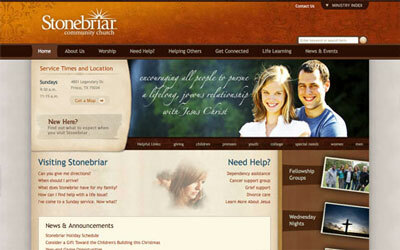 In the last decade, more churches have increased their visibility further by partnering with design and media firms. 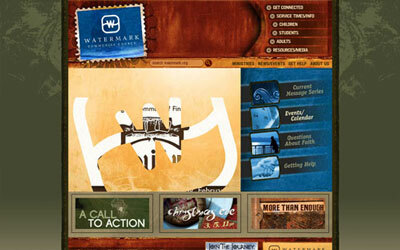 Many have assembled their own in-house marketing teams who collaborate with outside designers to produce contemporary and distinctive church branding. A new breed of pastors like Mark Driscoll and magazines like Relevant have achieved pop culture success with an emphasis on youth, visibility, and a carefully designed public image. 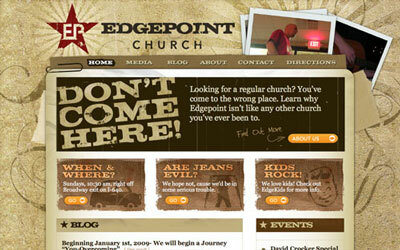 So what about the multitude of recent church web sites designed around ragged, dark, asymmetrical elements – what does this communicate about the church? 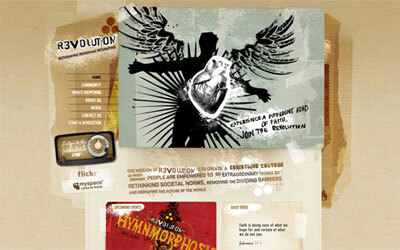 How many congregations identify with dark, gritty imagery? Churches going too far with marketing in recent decades might have had the opposite intended effect for some. Studies show that the “proportion of Americans without a religious preference doubled from 7% to 14% in the 1990s.” In England, between 1979 and 2005, “half of all Christians stopped going to church on a Sunday.” Does the aggressive, edgier approach to church marketing imply an urgency to reclaim members? So, if church web sites expect to convey the spirit of the physical church itself, what happens when remote design teams 1,000 miles away must design for a church unseen? Most designers interviewed answered simply, “lots and lots of phone consultation.” James Dalman says it’s taken 15 years for him to hone his own branding approach: asking the right questions to encourage the right answers. Dustin Stearman asks his clients “for a list of adjectives” and combines that with what he knows about their colors and typography. Improvisation is often required, as well as collaborating with in-house media teams that some churches deploy. Church designers seem to face a massive challenge: make beautiful, polished interactive experiences that retain humility and communicate spirituality, all without appearing contrived. Reducing the role of the ego is standard practice in nearly all religions, yet ironically many of today’s churches need to promote themselves more than ever as they seek greater numbers and visibility. 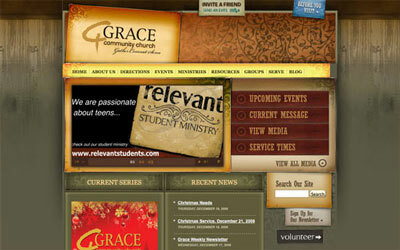 Do church designers feel conflicted, trying to convey core values while wrapping them in slick, expensive designs? The consensus is that business strategies can peacefully exist within church culture without compromising core values or tainting the role of the designer. As all the designers expressed, priority #1 is authenticity – an honest reflection of the church values that skew trendy for more than just trendy’s sake. As their designs reflect, many Christian churches of the last few decades are emerging as diverse, evolving organizations who see great value in staying current. It’s undetermined how much cutting-edge design is affecting the size of congregations, but existing congregants have a whole new breed of gorgeous, feature-rich web sites to connect them with their community. Darren Hoyt is a Virginia-based designer and developer with an emphasis on building for content management systems like Expression Engine and WordPress. 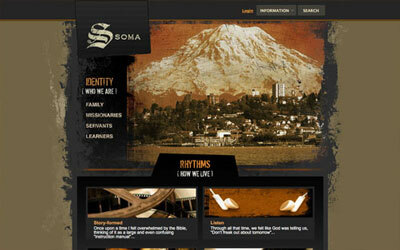 He also releases WordPress themes and other bits at his personal blog.